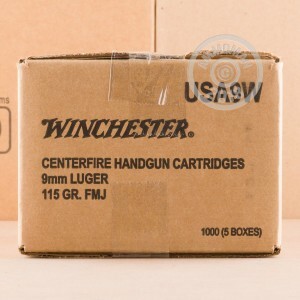 Inexpensive, reliable, and accurate, this Winchester "white box" ammo is a dependable training companion for your 9mm pistol. 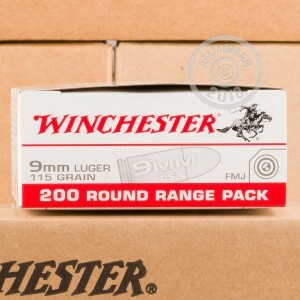 These cartridges use a standard pressure load and fire a light 115 grain full metal jacket bullet at a moderate muzzle velocity of 1,190 feet per second and produce mild recoil, making them great for long shooting sessions. 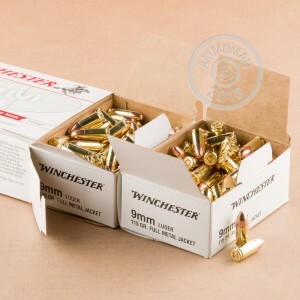 Buy this 1,000 round case or any other items priced over $99 to qualify for FREE shipping from AmmoMan.com. No nasty surprises at checkout! Gone through more than a 1000 rounds of this without a single misfire or other issue. Will be buying more.